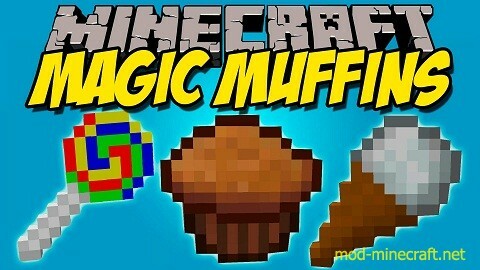 Magic Muffins Mod can make a muffin become magical by pouring a potion onto a muffin, and that muffin will have the exact same effect as the potion you poured onto it, but you can stack them to 4 and they will also fill up your hunger bar a bit since they have some nutritional value. All drinkable potions can be poured onto muffins to make them magical, including the bad-effect ones. Why you would want to make bad Magic Muffins is beyond me, but you can. Splash Potions cannot be made into Magic Muffins. No Muffin Grenades here. As an added bonus, you can also make Lollipops, Popsicles, and Icecream Cones, and you can pour potions onto these items to make them magical too. They work exactly like Magic Muffins except that when you eat them they only fill up your hunger bar a teeny bit because these kinds of foods are not very nourishing. Each of the new food items, Muffins, Lollipops, Popsicles, and Icecream Cones, can be stacked to 16. But once you pour a potion onto them they can only be stacked to 4 (you have to be more careful with them so you don’t squish the magic out). Muffins and Icecream Cones also have chocolate variants for all you chocolate lovers. Yum! Just substitute the Sugar in those recipes with Cocoa Beans. Muffins: The Bucket of Milk and Egg positions can be swapped. Plus, you can make the muffins chocolate by using Cocoa Beans instead of Sugar. Magic Muffins: You can put them anywhere in the crafting area. Lollipops: A stick and some sugar, just like in real life. Popsicles: An Ice Block can be used instead of a Snow Block if desired. Icecream Cones: You can make it chocolate by using Cocoa Beans instead of Sugar. The recipes for Magic Lollipops, Magic Popsicles, and Magic Icecream Cones are the same as for Magic Muffins, just substitute the Muffin with the yummy treat of your choice.